A haven of peaceful green meadows, hedgerows and woodland, this reserve offers a chance to experience some fabulous wildlife right in the middle of town. Car park at the Conservation Centre. Cattle on site throughout the year. Please see below under Access. 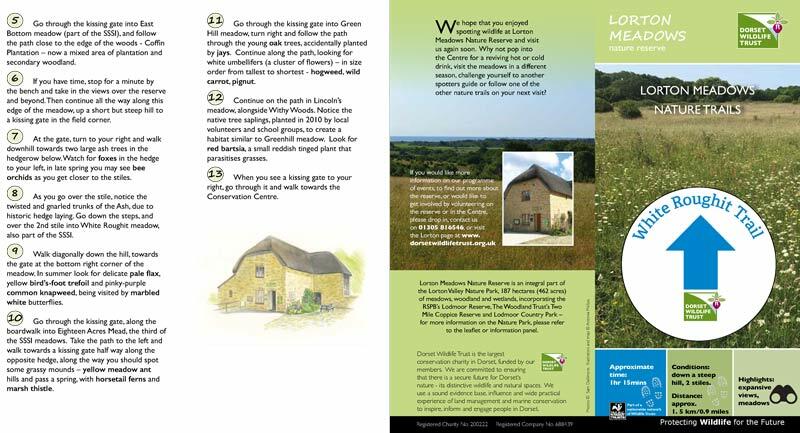 Network of marked paths including nature trails and the Legacy Trial (Lorton to Portland Bill) - leaflets available from the Lorton Meadows Conservation Centre. See below for maps to download. Gates at most entrances. Unsurfaced paths (apart from Centre surrounds). Disabled access and toilets at Centre. Access to the meadows is via field, bridle or kissing gates and stiles. There are regularly walked but unsurfaced tracks through the meadows, including marked nature trails, with visitors also free to make their own way between the fields on established paths, however the ground may be rough and uneven in places and can be muddy underfoot. In windy weather please avoid the woodlands. There are nine ponds scattered across the reserve, including a pond in the picnic area and one by the car park. Please be aware that we have cattle (cows and a bull) on the reserve throughout the year. Please refrain from walking your dog through the meadow(s) marked with a red Dog Traffic Light. 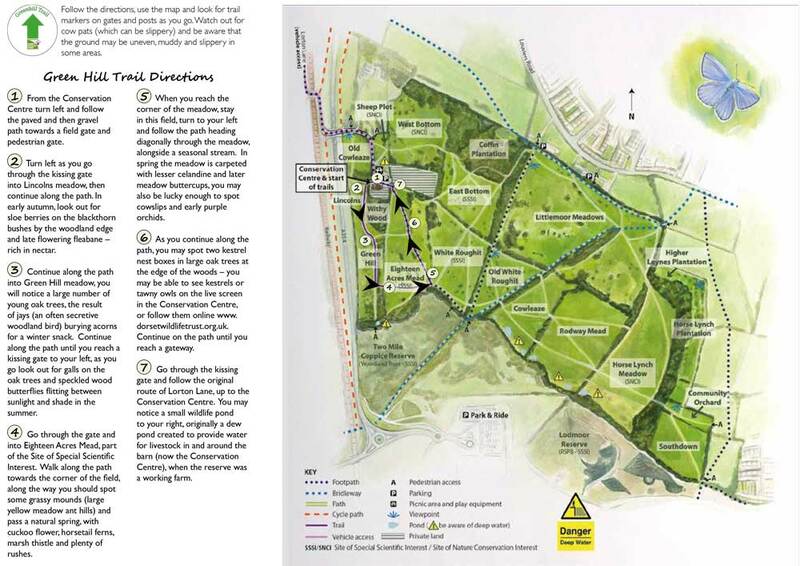 For more information, please see the posters and leaflets at the Conservation Centre and signs on the field gates. See a map of the affected area below. Please take precautions against ticks. On a lead or under effective control. No dogs in field with cattle. Dog Traffic Light system in use check signs at centre and on gates. Please remove any dog mess from site. See above for more information about dogs on nature reserves. Reserve - open at all times. 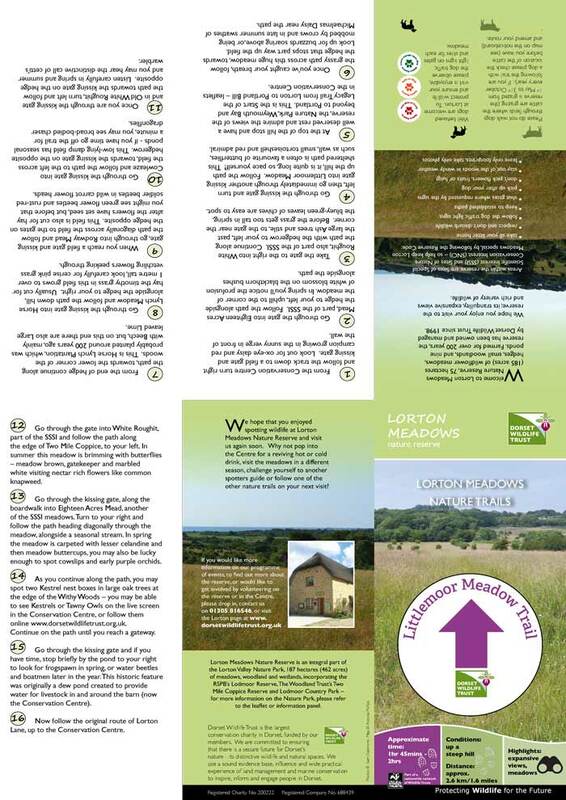 For Visitor Centre & toilets see Lorton Meadows Conservation Centre page. Anytime, but spring and summer for flowers, insects and birds. At Lorton Meadows as the first morning light filters through the woodland and mist blankets the ponds, the night time cry of the barn owl has given way to the vibrant chirp of the song thrush. This wildlife haven to the north-west of Weymouth is a patchwork of unimproved meadows enclosed by thick hedgerows and small copses nestling in the Lorton Valley. 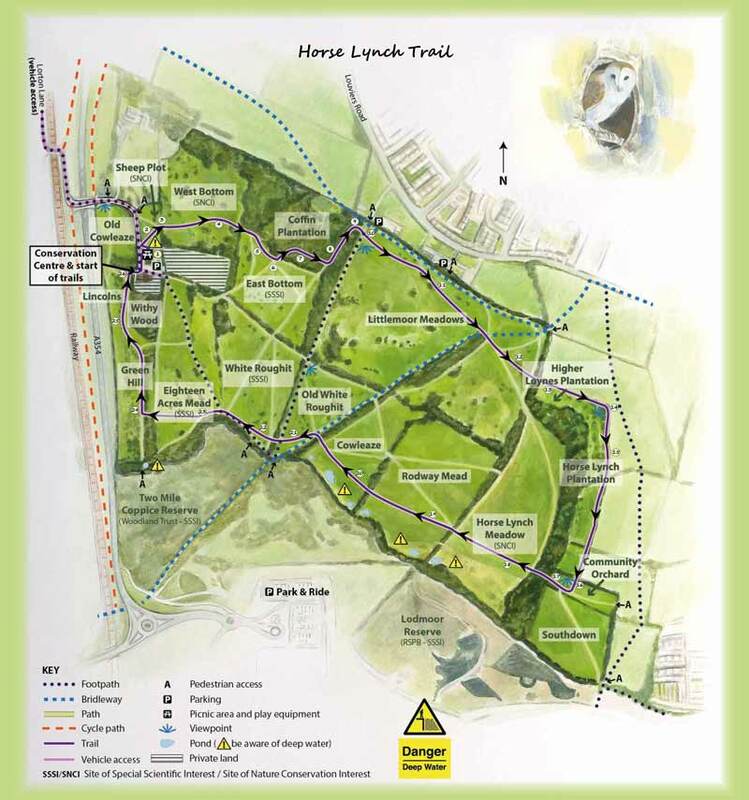 The multiple trails and pathways provide an opportunity to explore and experience a wonderful variety of wildlife just a stones’ throw from the residential areas of Littlemoor, Upwey and Weymouth. On a bright summer’s day, the meadows and hedgerows are busy with insect life; from butterflies dancing over the wildflowers and grasshoppers in the meadows, to moths, bugs, beetles and dragonflies. A summer amble along the pathways and trails will also reward you with the sight of colourful and some quite rare wildflowers, including orchids and corky-fruited water-dropwort dotted around the reserve. The reserve provides excellent foraging and flight lines for bats like noctules. The scrub and hedgerows bursting with the songs of birds like lesser whitethroat and grasshopper warbler. Go for a short walk through the shady woodland or follow one of the longer tails across the top of the meadows and then make your way back to the Conservation Centre for a hot or cold drink before heading home. From the B3159 (Dorchester Road), turn into Lorton Lane and continue to the end of the lane, approximately half a mile, where you will reach the Conservation Centre & carpark. Cycle path access from Dorchester, Weymouth or Upwey Station with cycle racks available at the centre. 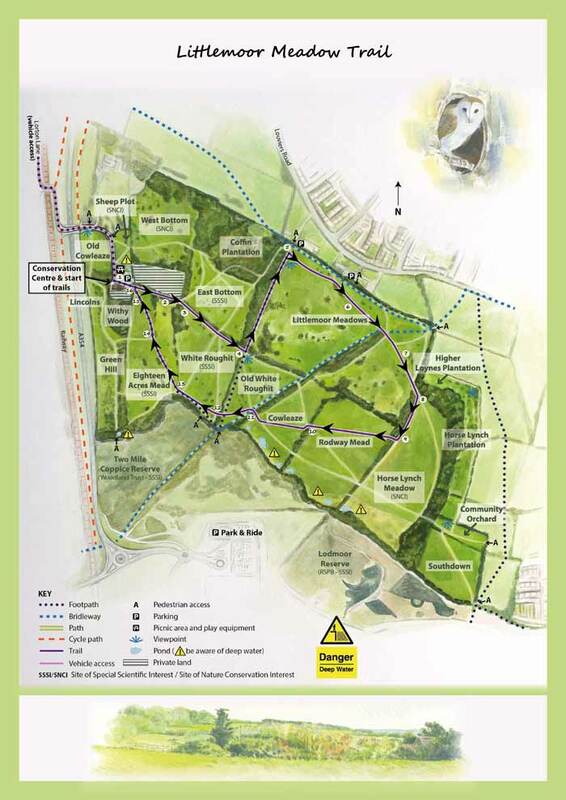 The map below shows the entrance to Lorton Lane from the B3159 (Dorchester Road), Lorton Meadows Conservation Centre and car park (please be aware of pedestrians and cyclists on Lorton Lane). The cycle path from Dorchester to Weymouth alongside the A354 joins Lorton Lane at the bridge over the A road. There are pedestrian access points: along Lorton Lane, from Littlemoor (Louviers Road) and the Park & Ride - find out more about this here. Help make a difference to your local wildlife by volunteering at Lorton Meadows. You could join us fortnightly for our Volunteer Conservation Tasks, managing habitats for wildlife across the reserve, or survey butterflies, wildflowers, invertebrates, reptiles or birds across the reserve. Please contact us on 01305 816546 to find out more. 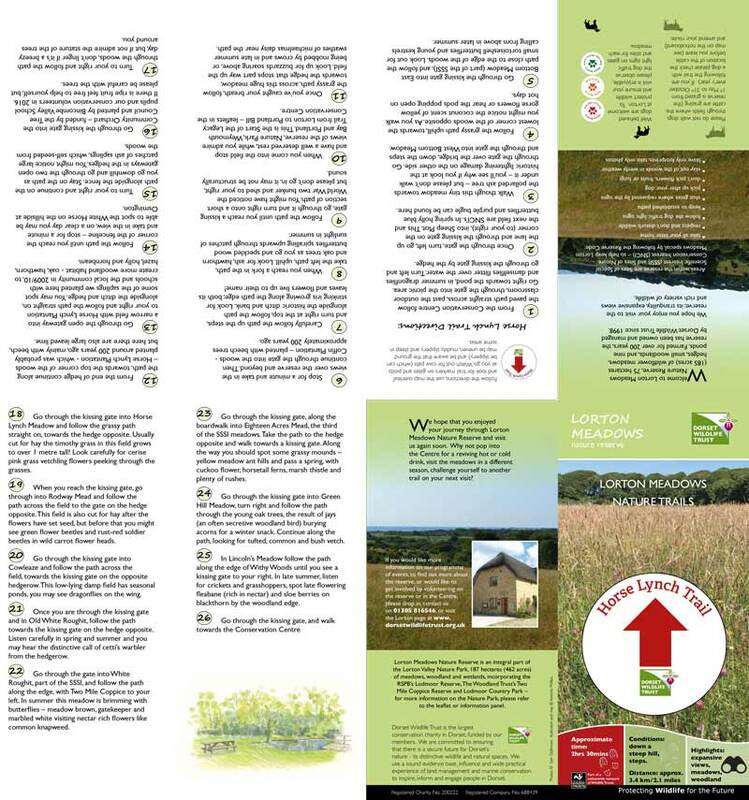 Please see below for a link to the Lorton Meadows dog traffic light guidance leaflet and a map with the areas affected by grazing cattle. The Legacy Trail links Lorton Meadows to Portland Bill, via a 20 km trail, discovering all the boroughs important nature sites along the way. You can attempt the whole trail in one day, or walk it in sections, or follow one of 9 circular walks starting from each of the waypoints. For printable trail and circular walk guides go to the Legacy Trail webpage. 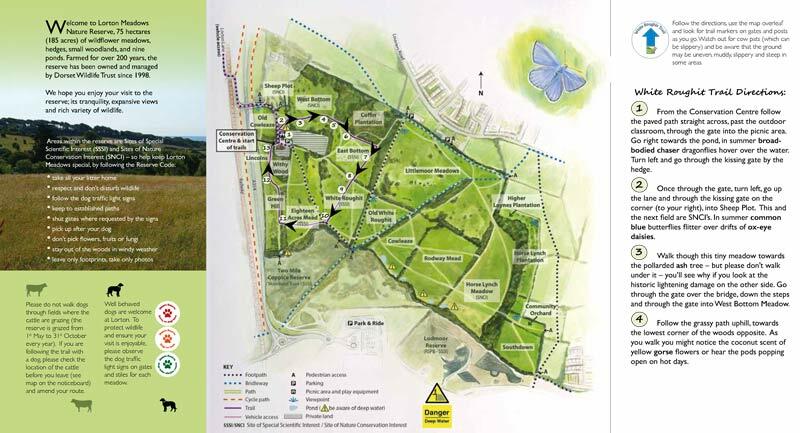 Lorton Meadows, the RSPB's Lodmoor Nature Reserve, the Woodland Trust’s Two Mile Coppice reserve and Lodmoor Country Park together form the Lorton Valley Nature Park, a green lung for Weymouth. The diverse 187 hectare site melds family activities and nature - with wildlife rich meadows, wetland, ancient woodland and family facilities open to all – plenty for visitors to explore.